Ever since kindergarten, moose has been making mixtapes. Well, probably not the type of mixtapes you're thinking of, but rather, radio tapes. Moose wanted to be a DJ on the radio so bad, that he and friends would make tapes with a tape recorder, a microphone, and songs recorded off of the radio. 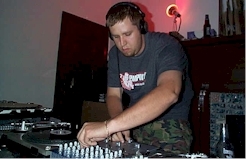 Since then, DJing has become more then just a dream for moose by establishing himself as a well recognized name in the Pittsburgh / Cleveland / Columbus / Cincinnati rave scenes. Moose blames his love for electronic music on DJ ICEY. "I would go to this club called BB McKlaine's, just because the DJ was spinning records…and at that time, I already had turntables. (I was aspiring to become a hip-hop battle DJ.) One night, the DJ dropped 'Not a Test'. It was like nothing I'd ever heard before. So different, but yet, so damn funky…I went nuts on the dancefloor. After the song was over, I ran over to the DJ booth and asked what the name of that track was. The DJ held up a white label with 'ICEY - NOT A TEST' written in crayon on the label." This led moose to start collecting breaks records. "Pretty soon, I had almost all of Icey's records…and one day, my buddy gave me a flyer to a show in Pittsburgh that Icey was playing at. It was 'Ultimate' thrown by the Sunshine Kids, and I had to go…even though I really didn't know that it was a 'rave'. I get there, and had a great time. I actually met and talked with Icey, which was cool. Most importantly, I got to see what 'rave DJs' were doing…and I loved it!! It was then and there that I decided to give it a try." Moose spun at his first party in August of 1999; Nuclear Confusion thrown by Infinite Velocity Productions in Johnstown, PA. Soon after, he was asked to join Infinite Velocity's roster, an affiliation that moose has always cherished and valued. "They're the ones who gave me my first chance. Who knows where I'd be if it wasn't for them. For that, I'll ALWAYS represent Infinite Velocity." Since then, moose has spun at countless events all around Ohio and Pennsylvania. With four major CD/mixtape releases under his belt, moose has been building a solid fanbase in the area. "More [releases] are to come…but right now I'm developing my production skills. My goal is to release a CD of my own music sometime soon." Musical Instruments, Textiles, Jewelry, and Architecture was moose's first mixtape to become widely known. "That tape really got my name out there…I was able to give the kids something to take home after I played….and that way, they remembered my style." Musical Instruments was followed up by two increasingly popular mixedCD releases by moose, If I was a Mixtape, and Putting Things Together. The mixtape, FUNK THAT NOISE!!! was a collaboration/tag team mixtape with good friend DJ A, a.k.a. Andy the pooh. Moose also tag teams with the likes of Ben Kenobi, Dez Drastic, Hutch, and the rest of the Breakbeat Militia. Moose's unique style sprouts from his hip-hop influence. Blending hip-hop with breaks and jungle as well as keeping the crowd entertained has been moose's goal and motivation from the start. "All I want to do is make the whole crowd bounce, yall! ", a sample of Snoop Doggy Dogg in a J-Smooth track, is what Moose uses as a slogan for every performance.